Electrically insulated glassfibre stiles to 30,000 volts. Easy to operate internal spreaders. Braced, slip resistant treads for added strength and safety. Compatible with Werner 'lock in' paint, tool and equipment accessories. EN131 compliant for trade use. Made in UK., shown below. When working in a trade reliable equipment is a must, ensuring that the user can work safely and confidently to give all of their focus to the task in front of them. Our glass fibre steps for trade use with a platform are ideal for professional and domestic use as they conform to EN131. A safety feature of these steps is that they have non-conductive glass fibre stiles to 30,000 volts, making them suitable for electricians. 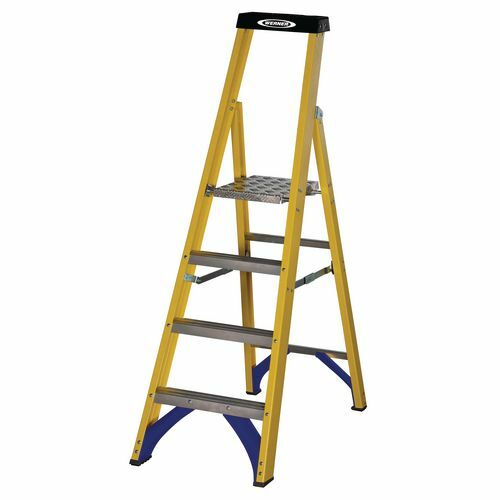 The slip resistant traction tread steps provide excellent underfoot grip for any user. Heavy duty internal spreaders, which are easy to operate, make the steps easy to set up and protect them from accidental damage. They are available in six platform heights; 940, 1170, 1410, 1870, 2330 or 2800mm. A full range of 'lock in' paint, tool and equipment holders and can be viewed in the 'Products frequently purchased together' section below. Our glass fibre steps for trade use with a platform; they are a great choice for trades' people offering support and stability while working. They come with a 12 month guarantee and FREE UK Delivery. A deep tray with 11kg load capacity. Integrated tape measure and screwdriver holders. Storage holes for tools or rags. Grooved top to hold pipes, etc. 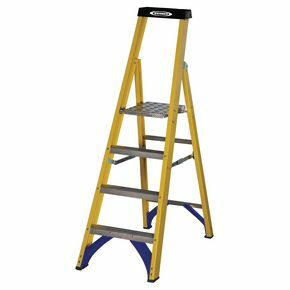 Suits both the industrial and trade glassfibre steps. Built in magnet secures brush. Cup liners available to keep clean interior. Screwdriver, pliers, putty knife and towel holders. In line sockets for 'paint cup', 'tool lasso' or 'utility hook'. Holds extension cords, hoses, etc. Wraps around the grip of power tools, etc. Locks into top of step. Pack includes one belt clip and two tool lassos.